Team Challengers participated in SAE International Aerodesign held at Lakeland, Florida, USA in Micro class and Regular class category. They have secured 2nd prize for oral presentation in micro class category with enormous appreciation for their technical presentation skills. Kausthubh Pallot, Rakshith Karumbbaiah, Akshay P N, Ranjitha H K, Nanda Kumar, Prashabh J P, Vikyath M, Prabhath Shenoy, Mahadeva, Ananya, Shrinidhi & Shwetha made this ultimate team. 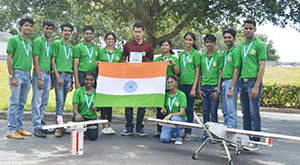 The same group was also placed fourth position in micro payload lifting capacity and fourth in regular class design report. Pre-selected 75 teams from all over the world participated in this competition.